It was only a matter of time before anti-terror authorities reported that radicalized American or immigrant Muslims had returned home to the U.S. after taking up arms with ISIS in Iraq or Syria. 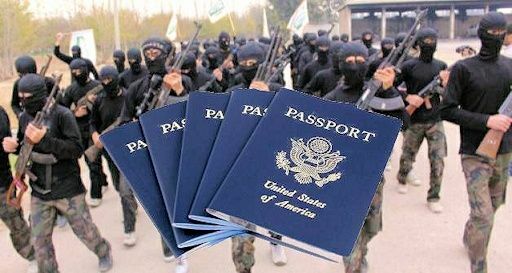 If you go to Syria or Iraq to fight as an unauthorized civilian, you are not coming home to the U.S. Responding to the White House disclosure, NYPD Deputy Commissioner for Intelligence John Miller said that the department and the Joint Terrorism Task Force are looking at “a small number of people . . . in the New York area” who are suspected of having gone to Syria to support factions in the civil war there other than ISIS. civilian, you are not coming home to the U.S.
Everyone now knows — no one more than NYPD brass — that even a lone wolf can do huge damage, and the possibility for harm rises exponentially if a would-be terrorist has gotten sophisticated training of the kind that ISIS is fully equipped to provide. In an ultra-sobering assessment of the terror threat published in Sunday’s Daily News, Police Commissioner Bill Bratton noted that an ISIS-affiliated gunman had killed three people in an attack on the Jewish Museum in Belgium, while another was busted in France mixing explosives.